West Queen West is decidedly my favourite district to shop in the city. Now the area has gotten just a little bit prettier with the opening of our hip + urban store of the week, Bicyclette. What started originally as a carefully curated online boutique, upgraded into the occasional pop-up store in the latter part of last year and has now transformed into the go to spot for pretty young things who choose to see the world through rose-coloured (and possibly rhinestoned) glasses. Bicyclette is a magical place filled with sweet neon bow belts, pastel boyfriend jackets with ruched sleeves, and oodles of sparkly accessories. To offset the cutesy, there's tons of edge. Cool cropped tanks, lacy bralettes and high hemlines abound. Behind it all, owner Paige Boersma, is the poster child for Bicyclette. I've never seen her anything but stylishly dressed with look that's usually super feminine (think pink) but sprinkled with a little bit of rebel (bold rings on every finger). She's the sweetest shop girl, but her creativity and talent shines, not only with her amazing eye for finding unique apparel, but also in merchandising, Bicyclette. Between the chic "bicyclette" with a retro basket sitting in the front entrance, a glittery castle in a curio cabinet and vintage tea cups that display dainty accessories, the store really gives off a wonderland vibe that's hard to resist. I love that Paige pays homage to our local talent with accessory designers like Lauren Elan, Hello Denj and Scarfparty in store but her mix of labels I've not seen elsewhere in the city is a huge reason to pop in and say hello. Along with staples like a great printed tee, Bicyclette is a fabulous spot to pick up trendier lace, neon and nautical pieces. Even if you're on a spending diet, candy coloured quilted chain strap purses, multi-purpose balms from DaLish Cosmetics and designer nail polish from Butter London are budget friendly treats. If you're ready for some serious retail therapy, however, you can easily find head to toe looks in Bicyclette while definitely creating a look that's unique. A few tips for my fellow hip urban girls before heading to Bicyclette: First, visit with time to browse! There's tons to see on the racks, but also on the unique display vignettes throughout the store. Next, don't be timid to ask for advice. Paige's visual and styling abilities are quite obvious just check her amazing self-styled look books and blog posts. Lean on her expertise and you'll leave with something fabulous. Third, if you love something, take it home. Bicyclette only carries limited quantities of each style / size. Last, pop by frequently or keep up to date with what's in store via Bicyclette's facebook, twitter or blog. I was one of the first to learn that they were carrying Butter London polishes through the twitterverse. Score! Bicyclette is located at 880 Queen Street West, Toronto, ON. Shop Tuesday to Saturday, 11 AM - 7 PM, Sunday, 12 PM - 5 PM or online 24/7. 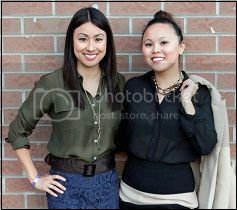 -- Tamika Auwai is a fashion junkie, splurge-a-holic and the Founder of Shop Socials.